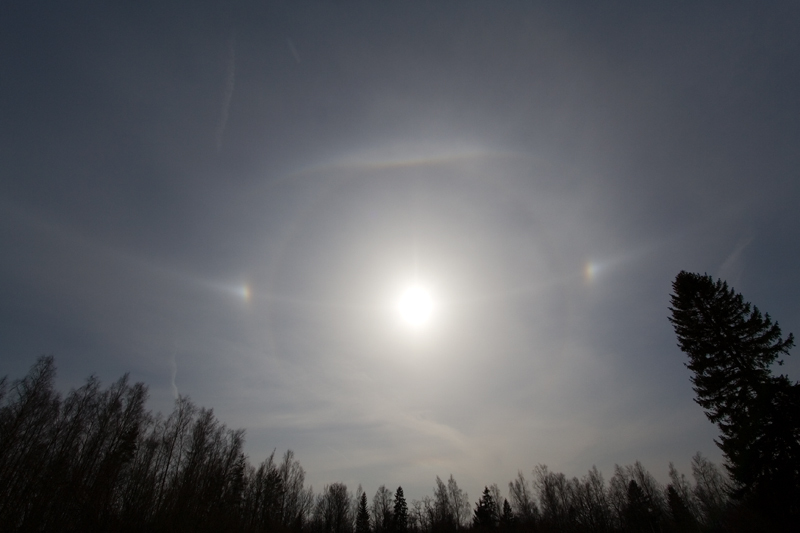 A series of complex halo displays occured in Eastern Europe between 27 March and 6 April. The first display in this series was seen in Vecsés, Hungary (observer: Ágnes Kiricsi). On 27 March at 13:30, after the appearance of the shining 22° and circumscribed halos, the parhelia started getting brighter and brighter, and together with them, a growing stretch of the parhelic circle came to sight ( 1 ). In about a quarter of an hour, as the clouds were passing towards the east, the 120° parhelion showed up on the left ( 2 ). 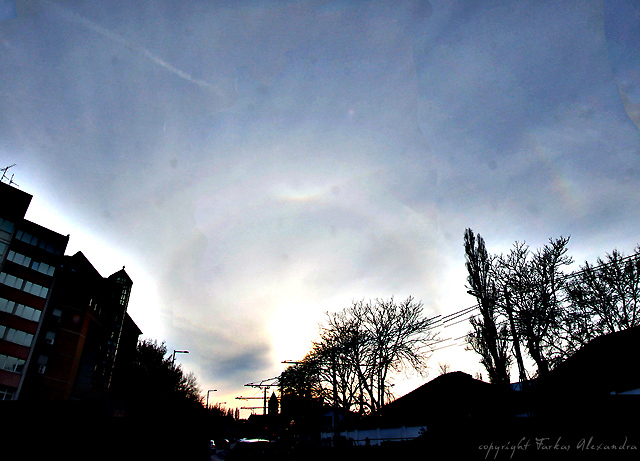 The phenomena lasted until 14:10 with the complete parhelic circle visible for about 5 minutes. 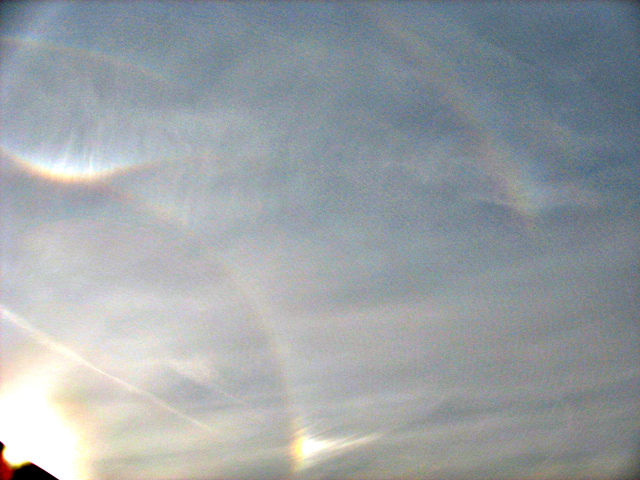 The display continued until sunset with a 22° halo, parhelia, upper tangent arc, circumzenith arc and supralateral arc. In Vecsés, the clouds started thickening, but in Budapest the conditions got better at this time of the day. In a rather narrow stretch over the capital, a Tape arc was observed between 16:40-16:56. Images were taken by Alexandra Farkas and Tibor Hollósy ( 3 and enhanced 4 ). They did not see other halos formed by Parry oriented crystals, but 7 km to the north and only 3 minutes earlier, Márk Laczkó had photographed an upper suncave Parry arc ( 5 - 6 ). In Hungary, there were two other observations of complex displays with complete or almost complete parhelic circles. One on 1 April (Ágnes Kiricsi in Vecsés), the other one on 5 April (Alexandra Farkas, Tibor Hollósy in "Remete" Gorge). On 2 April, after a long time period, Marko Krusel also had an opportunity to observe a complex halo display in Estonia, nearby Keila. The peak time was 14:30, when the sun was 30.9 degree above the horizon and the sky was covered by cirrostratus haze. Besides all the common halos like 22° halo, upper and lower tangent arcs, parhelia, supralateral arc and CZA, he also got a bright upper suncave Parry arc, a nice full parhelic circle and 120 degree parhelia. A fragment of the infralateral arc was also seen on left. The show ended at 16:00. 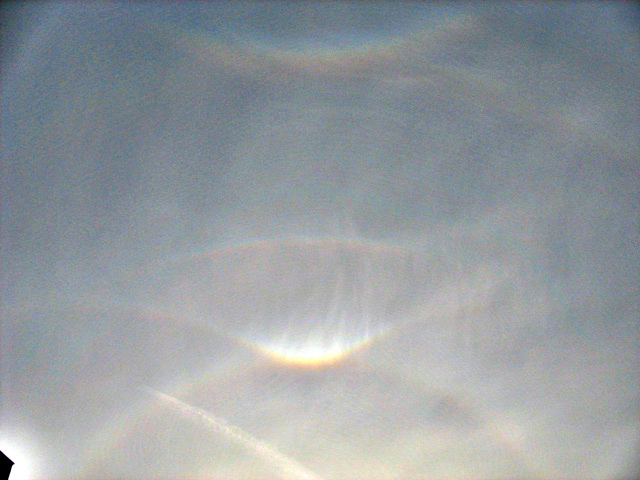 Suprisingly the right side parhelic circle and 120 degree parhelion were the latest leavers ( 7 ). 6 April was a favourable day for the Czech Republic and Poland. The Czech Matej Grek (Ostrava-Dubina) and Martin Popek (Nydek) both photographed complex displays with parhelic circles and bright circumscribed halos. A 46° halo was also visible ( 8 - 9). 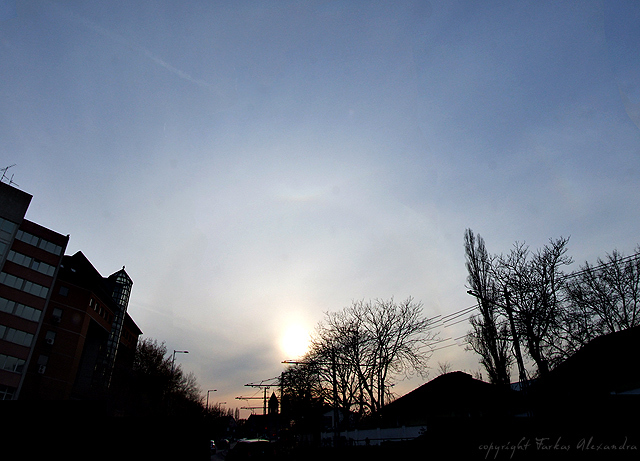 On the same day, Jakub Marchewka also observed rare halos in Chrzanów in the south of Poland. He saw well-defined 22° halo with parhelia, circumscribed halo and full parhelic circle on cirrostratus ( 10 - 11 ). When he looked through the photos he had taken, he noticed a faint Wegener arc ( 12 and enhanced 13 ) and 46° halo ( 14 and enhanced 15 ). It was a first observation of Wegener in Poland and one of the first of 46° halos. On 20th February 1661 Johannes Hevelius observed the Gdańsk halo display and he described a 46° halo. If he was right and did not mistake it for supralateral arc and infralateral arc, Jakub Marchewka's observation is the second in Poland.